I had an exhausting but amazing first week! We set up math graph books in both classes, boring but necessary. This introduced 6th grade to foldables and garnered the comment, “We sure use a lot of glue in this class.” Hahaha. Not THAT much glue! 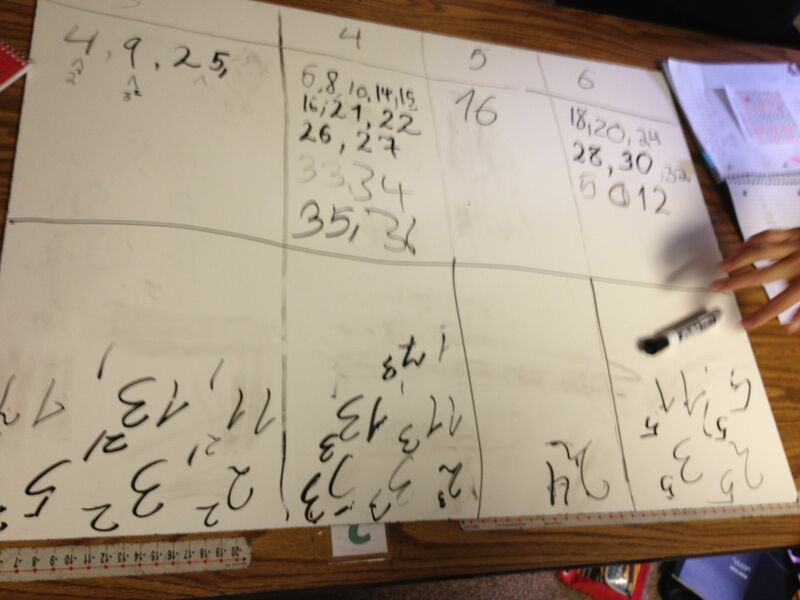 6th grade – We reviewed place value, fraction to decimal conversion, rounding, and rulers! I always have several 6th graders who write that 32/4 = 0.125 and my, “Estimate before you evaluate.” talk ensues, full of cookie examples. But, my first lesson in 6th grade is to introduce them to patterns, and I do this with the “Math in Nature” YouTube video followed by an almost blank Pascal’s Triangle. I just tell them, “There are a ton of patterns in here, can you figure them out?” and off they go! At the end we color the odd and even numbers different colors and I show them the large colored interactive Pascal Triangle online. 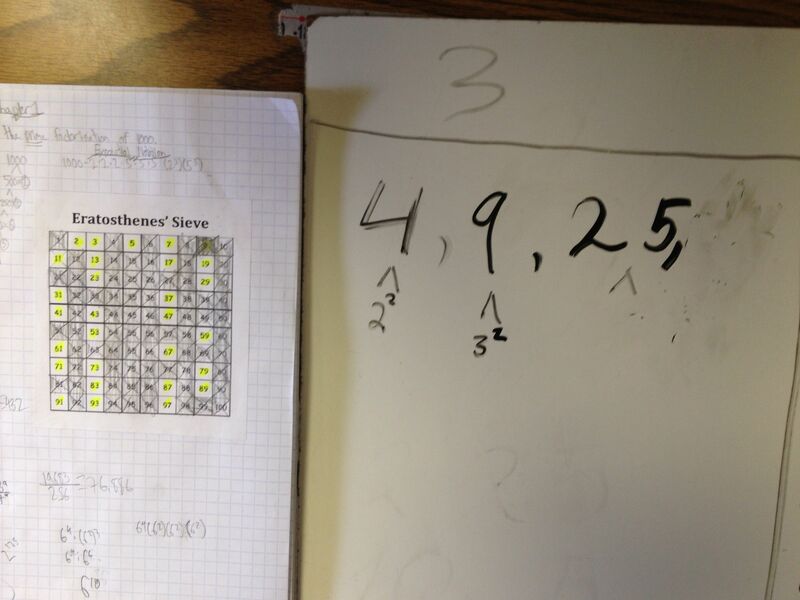 This is a huge hit with 6th grade students and I even had 5 students request larger blank grids. They are bringing them back to me next week so I can hang them on my bulletin board. Did I mention how much I adore 6th graders?? 7th grade was too exciting for words. I am focusing on “Notice and Wonder“, and problem solving with them. Everyday I hear kids say, “Whoa, mind blown!”. It’s pretty electric in there and I only have problem solving to thank! I took pictures last week but next time, I’m getting video clips. I cannot believe how much they have taken to the problem solving and how excited they are about it! After completing the Sieve Of Eratosthenes the first problem was “Factor Craze“. Thanks so much to Fawn for blogging about this great problem! I’m going to blog about just this problem when I have more time! It was a wonderful beginning of the year problem for 7th graders who are working on prime factorization and exponents. I told them they could try to find the rest of the patterns together and many groups of students emailed and googled chatted about it that night. Who can ask for more than kids chatting at night about math? Later that week we talked about number systems and I got to entertain them with Vi Hart’s video. They were mesmerized! And, they have blown my mind with their energy and enthusiasm so far! I’m counting on problem solving to keep puberty apathy at bay this year! Do you read the math in nature video out loud as it plays for the struggling readers in class? Great Math video, but I agree – the words are tough to read. Do you have a copy of your Pascal’s Triangle sheet?